Black Rhodium VS-2 is an upgraded version of the Stylus Tonearm Cable with advanced DCT and Crystal Sound treatment as well as Graham Nalty Legacy VS-2 Vibration Stabilisers. Black Rhodium Stylus VS-2 Tonearm Cable is fitted with two Graham Nalty Legacy VS-2 Vibration Stabilisers and brings you fast and crisp sound at a budget separating musical instruments superbly through a dramatic reduction of Transient Phase Distortion. The Graham Nalty Legacy VS-2 Vibration Stabiliser is specially designed to reduce audible cable distortion by limiting the effects of vibrations travelling through the conductor wires. Mechanical vibration within audio cables changes the electrical characteristics of the cable seen by the sensitive electrical voltages that carry the music signal. The effect of these changes modulates the sound signal and creates noise and distortion. Applying Vibration Stabilisers at both ends of the cable, effectively reduces mechanical vibration introduced at either end. The tighter sound of the VS-2 is best heard in particular plucked strings such as double basses and harps which are reproduced in a much sharper presentation, massed voices in a choir also sound more like a choir of individual voices. 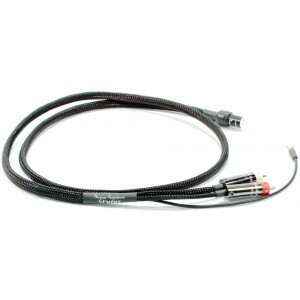 Stylus VS-2 employs separate coaxial screened cables for each channel. The screens protect the sensitive low-level signals from the turntable’s cartridge from picking up high-frequency noise and interference present all around. Further protection against noise and distortion is provided by placing both channel cables in an outer jacket, preventing the return conductors of both channels from acting as a ‘loop aerials’ for RFI. Using thicker insulation than is usual in interconnect cables increases the distance between conductors. This reduces the magnetic field seen in each conductor wire as a result of the magnetic field created by the current in the other conductor wire. The benefit in listening is a clearer and more open sound quality. Complementary filtering techniques ensure that any interference that does penetrate the cable’s very effective defences is neutralised preventing audible distortion interfering with the music. All these treatments are designed to reduce the amount of audible distortion in the cable, allowing cleaner, clearer sounds to be enjoyed from your equipment. Stylus VS-2 tonearm cable uses two silver plated copper cores insulated in low loss PTFE dielectric for positive signal flows. PTFE insulation is used because its low dielectric loss ensures extremely low distortion due to dielectric absorption effects in which sound energy is absorbed in the insulation and released at a later interval of time to create highly audible time-smearing distortion. Stylus VS-2 is terminated with ultra-high quality Rhodium Plated plugs. The Black Rhodium plated DIN connectors is specially designed for use in Black Rhodium tonearm cables. The RCA end is terminated with Graham Nalty Legacy Range GN-3 RCA connectors. These have been specially manufactured to ensure that Black Rhodium cables deliver the very best sound quality possible. All terminals are treated with advanced DCT++ cryogenic which involves temperature processing above and below room temperature. The DCT++ process alters the molecular structure of the cable to improve uniformity. The benefits of this are everlasting and bring an improvement to every single aspect of the cable's performance. In addition, all terminals are also treated with the crystal sound process which refocuses the outermost skin of the connector. The result is the conductor surface is more closely packed and regular with a continuity aiding conduction through removal of voids left by the drawing process. Crystal Sound process leads to more powerful and refined bass notes while other notes have greater clarity in their sound.